How do you last a quarter century in television and still make people smile? You could have an arsenal of one-liners like Johnny Carson. Or you could call the planet Gallifrey home and have two hearts, a 60-degree body temperature and the unusual ability to regenerate — seven times so far. Meet "Dr. Who," the subject of a British science fiction classic with a well-deserved cult following here. Now in its 25th season, the longest-running science fiction show on television invades New Jersey tomorrow for an appropriately offbeat silver anniversary celebration. Festivities include a gathering of the faithful, known as "Whovians," at Newark Airport's Marriott Hotel, hosted by New Jersey Network (NJN). At 9 p.m. tomorrow, NJN shows a one-hour documentary it co-produced with BBC/Lionhart, "The Making of Dr. Who," to be broadcast locally on UHF Channels 50 and 58. Appearing at Dr. Who's party will be the good doctor himself, veteran British actor Sylvester McCoy, 45, who is the seventh actor to play the role. Joining him for lunch, mingling and a screening of the documentary will be his faithful assistant, Dorothy or "Ace," played by 26-year-old actress Sophie Aldred. Why the appeal? "It's science 'fiction with a sense of humor," says Mark Modig of Morristown, who heads a group of 300 northern New Jersey "Who" aficionados, the "Jersey Jagaroth." The name is taken from a monster in the show of the same name. "'Dr. Who' is a stereotypical character in many ways; he's always for the underdog and always stands up for right over wrong," says Modig, an AT&T software engineer. "There's a message but they don't hit you over the head with it." So do "Jagaroths." The group has monthly meetings, an annual picnic and parties where members dress as members of the show, much like "Rocky Horror Picture Show" fans. They also religiously watch the program, which airs at 7 p.m. most Saturdays on NJN. "The show doesn't have the soapbox tendencies of "Star Trek" and other American science fiction shows," says "Jagaroth" member Gene Cahill of Budd Lake. "Star Trek' takes itself so seriously, especially when William Shatner makes a speech," says Cahill, manager of an Ocean County comic book and game store. "'Dr. Who' is different. The plot may be serious but the main character isn't always the same." Indeed, he's the scatter-brained professor type, less at home making speeches than habitually playing with a yo-yo as a gravity test. No wonder he chases villains in ill-fitting plaid pants, a sweater adorned with question marks and carrying his trademark umbrella. And no wonder he downs massive quantities of the British candy, "Jelly Babies," and acts more like Stan Laurel than Dr. Spock. Says Cahill: "It's very British, not really wild, zany humor but more understated and subtle than that." The slapstick McCoy brings to his role the kind of humor perfected in a long, semi-serious career in British theater. Among his recent roles was a perishing Antarctic explorer in the PBS series, "The Last Place on Earth." "A science fiction program allows the creative staff to enter into fantasies of all kinds," says McCoy. "The stories can be about anything; they can go back and forth in time, be a mystery, an adventure, a love story." And they can be very, very funny. "I used to watch 'Dr. Who' as a child and I was afraid of the baddies, like the 'Daleks' and the 'Cybermen'," says Aldred. As NJN's Beth O'Connell says, 'The Wizard of Oz' himself couldn't be more fantastic or inventive than 'Dr. Who'." Tickets to the convention, costing $15, will be for sale at the door. Caption: Dr. Who (Sylvester McCoy) and his assistant 'Ace' (Sophie Aldred) are held captive by the Cybermen in the documentary, 'The Making of Doctor Who,' which airs tomorrow at 9 p.m. on New Jersey Network. APA 6th ed. : Reisler, Jim (1988-11-18). Dr. Who fans celebrating. Daily Record p. B1. MLA 7th ed. : Reisler, Jim. 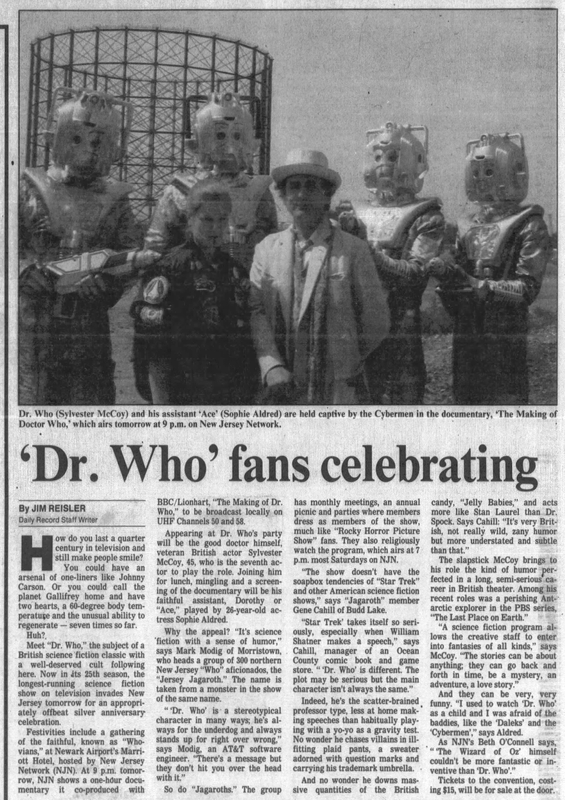 "Dr. Who fans celebrating." Daily Record [add city] 1988-11-18, B1. Print. Turabian: Reisler, Jim. "Dr. Who fans celebrating." Daily Record, 1988-11-18, section, B1 edition. This page was last modified on 15 April 2019, at 02:29.